Hi, my name is Erika and I am 24 years old and I have been ill all of my life. Symptoms of autoimmune diseases (Perthes Disease, a hip disease, and Vitaligo -a skin pigment disorder) started at an extremely young age, causing problems learning in school and socializing. Then I came down with Lyme Disease in fifth grade, which I believe was after a family trip to Maryland. I had multiple NASTY flus that just wouldn’t go away since then. I continued to press through my symptoms thinking it was a way of life. Until 6th grade when my cat died, I started REALLY noticing I definitely had abnormal issues with learning, anxiety, depression, fatigue….etc. I started dancing in 6th grade because that was my dream after the hip disease “went away”. So from 6th grade to a year or so after graduating, I was dancing A LOT. Plus I went to school and work and volunteered at church. I constantly battled joint pains, migraines, GI issues, breathing issues and finally, in 2010, it completely took over my life. I had been to Belize a year or so before that and ended up with MORE unusual bug bites and came back HIGHLY emotional. All that stress was NOT good. After that I ended up experiencing horrible memory loss, migraines, a concussion and shortly after- wisdom teeth extractions. I had to stop dancing, working, going to school, hanging out with friends, etc etc. I couldn’t keep up with people even younger than I. SOMETHING was wrong and after seeing MANY doctors, I finally was diagnosed with Chronic Neurological Lyme Disease and co-infections plus several other illnesses that have made my situation a whole lot more complex and confusing. I’ve had doctors look at me and say “I can’t help you” and if you keep going the way you’re going you will be dead within a year or less.” Scary. After antibiotic treatment in 2011 I ended up in the hospital with SEVERE PAIN, SEVERE depression, and EXTREMELY HIGH liver enzymes. I was told to stop antibiotic treatment. That was scary to me. I then began homeopathic treatment which didn’t help much, but it did give me clarity of how much my body was struggling and what organs needed the most support. 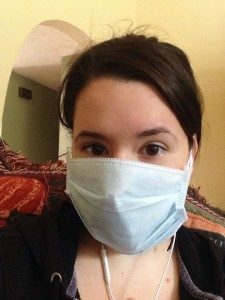 After living at a “friend’s” house I was in denial that I was STILL very ill and needed treatment. I lost my boyfriend, and my relationships with my family were seriously strained. Since then I have been admitted to the hospital numerous amounts of times and it is getting exhausting trying to fight all the symptoms that lead me there. 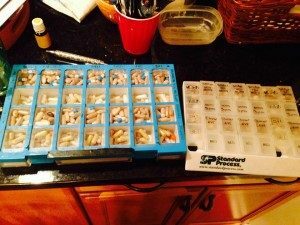 Since beginning of 2013 I have been seeing a functional medicine doctor who has me doing IV treatments every week, taking supplements and herbs all day every day, etc. It’s been an exhausting road in every way possible. I have my parents’ support, but the support of others is at a minimum. I can’t drive and barely see anyone outside of my own family/home (siblings are moving on in their live’s and don’t understand and here I am still relying on my parents for practically everything). It’s very hard for me. I can’t explain how hope has been strong enough to overcome all the negative things and thoughts I deal with every day, but here I am- fighting on like all of you brave Warriors. Let’s keep encouraging each other and lifting each other up in encouragement and/or prayer (whatever you feel led to do). We need each other. I finally have realized I cannot do this alone. Please don’t hide when you are at your worst. That is the moment you really need to reach out for help. It will also give you an opportunity to show others how much you REALLY ARE struggling. We just have to let our guard down with the ones we trust….somehow, some way.